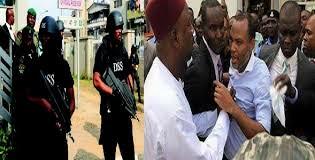 Information reaching Biafra Writers from a reliable source within Nigeria security operatives revealed that members of Buhari's Gestapo outfit also known as the Department of States Service, DSS on Tuesday evening 10th of January, 2017, after court hearing of IPOB leader, Nnamdi Kanu’s treasonable felony case stormed the popular Utako bus terminal that houses most transport companies especially those commonly patronized by Easterners in search of Biafrans who had earlier gathered in solidarity with their leader at the federal high court, Abuja, that was not the first time such move was made our source further revealed. The officials of the Gestapo organisation who came with an "unmarked Hilux bus" were vividly seen by IPOB intelligence unit patrolling from one end of the terminal to the other in search of Biafrans who they had expected to board buses from the terminal back to their various bases, confirming the inormative revealed to us. The Gestapo outfit officials were noticed to be fixated and looking at the faces of the passengers to see if they can recognise those they had seen in the court earlier. The high rate of disappearance of Biafrans who had travelled either to see the IPOB leader or march in solidarity with him of which the disappearance of Moses Agbo an IPOB journalist is the most recent, necessitated this special intelligence surveillance by the IPOB intelligence unit. Puzzled by this development of continuous molesting, kidnapping, disappearance and in most cases murder of innocent Biafrans, those travelling to any of our solidarity rallies are directed to be weary of the activities of this Geatapo organisation and to protect themselves from falling victims to them. On behalf of IPOB leadership, Biafra Writers are by this notice alerting the world to be aware of Buhari's secret ploy to exterminate Biafrans by every means possible. In this regard, we are directing all Coordinators in Biafra land as well as those in the contraption called Nigéria to always thoroughly cross check the numbers of Biafrans that travel to each rally or court sitting from their states with those that eventually return and do not hesitate to raise alarm inot event of unaccounted rally/court attendee(s). DSS should be held accountable for missing Biafrans henceforth since they have formed the habit of kidnapping Biafrans definitely without trial. As at last count, over 25 innocent Biafrans are still being held and rendered incommunicado by the Gestapo outfit without trial. This is apart from those that have remained unaccounted for or considered "eliminated" by the notorious organisation's with killer agents. The list of those still being held includes Mazi Ikechukwu Ugwoha who was picked up on his way back to his state after visiting the IPOB leader, Nnamdi Kanu in Kuje Prison. He was arrested with 3 others in his entourage. Others are Bright Chimezie Isinwa, Mazi Obasi, Ekene Onuora, Sunday Okafor, Justice Ude, Asochukwu Boniface and many others. It is important to note that these innocents Biafrans have been in DSS detention for more than 120 days without been charged to court, which is a violation of their fundamental human rights. These secret killings, abduction and indefinite detention of Biafrans must stop and the sane world must rise up and condemn these unpardonable maltreatment of Biafrans.